The relatively cool-climate, north east part of Italy produces a style of Cabernet and Merlot that’s different from the rest of the world. Less intense and less macho. More everyday – medium bodied with a savoury/fruity character (check out Cesari Merlot $9). Inniskillin’s blend is similar to this style – lots of Italian-style vitality and brightness. Really good red for white meats and tomato sauced dishes. I’d like to see more local Merlot-Cabs crafted in this style. This is a bit confusing. The photo is of an Inniskillin Cabernet-Merlot. 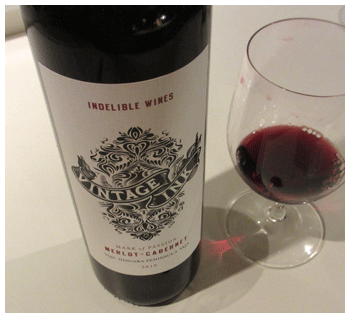 The Vintage Ink Merlot-Cabernet in the 1 Sep Vintages release, AKA Mark of Passion, is #250209; maybe Inniskillin makes it, but neither the label nor the listing says so. #245712 is a Vintage Ink Chardonnay AKA Rite of Passage. Thanks John. The correct number is 250209 and I’ve changed it in copy.